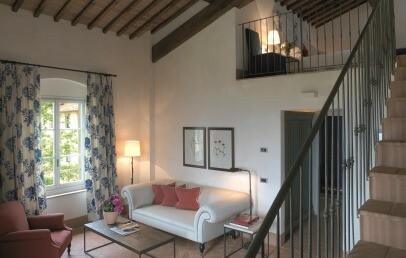 Nestled in the rolling hills of Florence, in the prosperous region of the Chianti Classico, COMO Castello del Nero is in an ideal location for exploring the beautiful Tuscany. 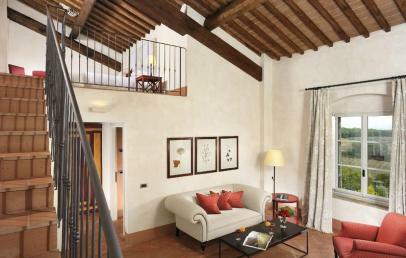 Just a few kilometres from the picturesque town of Tavarnelle Val di Pesa and only 20 minutes from the centre of Florence and Siena. The nearest airports are those of Florence (can be reached in about forty minutes) and Pisa (can be reached in about forty 1 hour and thirty minutes). 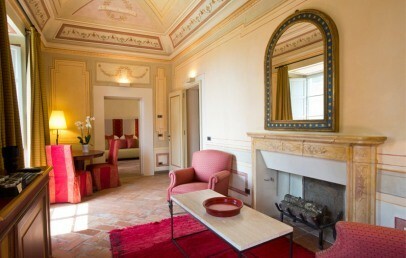 A typical example of a manor house in the Tuscan countryside of the twelfth century, COMO Castello del Nero is surrounded by an estate of 300 hectares, a nature refuge to pheasants and wild boars. Transformed into a temple to luxury, the restoration has preserved and highlighted its ancient splendour, with terracotta floors, antique fireplaces, original frescoes and impressive vaulted ceilings. On the property are 4 jogging, walking, different bike trails with VITA Trail and free access to the vineyards, forests, lakes, olive groves, fruit, vegetable garden and beehives. The residence is now under the protection of the Monuments and Fine Arts Department. The whole COMO Castello del Nero is non-smoking. The visitor can choose among 50 rooms and suites renovated with the full respect of the antiquity and prestige of this historic mansion, but with all the modern amenities essential to modern traveller: air conditioning, Wi-Fi connection, on demand TV free of charge, daily newspaper in room, Shuttle to/from Florence or Siena city centre according to day and schedule, use of the outdoor heated swimming pool (during summer), of the Fitness Suite and tennis courts. 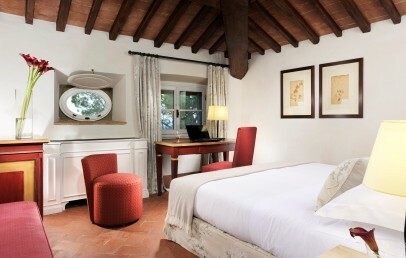 The rooms difer in design, style and furniture and feature wooden beam ceilings and marble bathrooms. 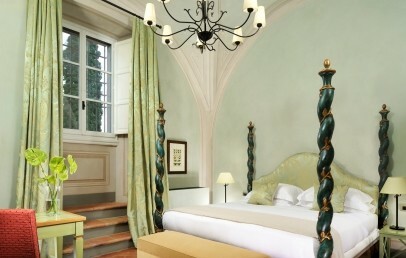 Each room is unique and its style is inspired by people who lived there in ancient times. 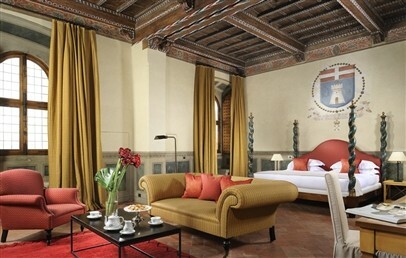 Some of them present warmly coloured walls which successfully matched with the original frescos and family crests. 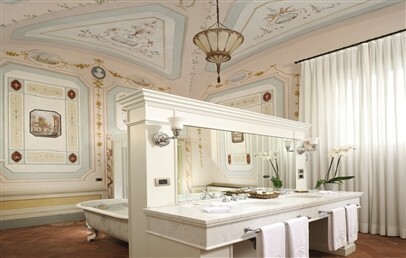 A stay in the suite is a dip in a bygone era with all the modern conveniences. Even the spa is up to the luxury standards of the hotel, with natural wood furnishings, smooth glass and slate. Thousand square feet of space dedicated to mental and physical wellbeing, in a perfect blend of ancient techniques and modern treatments: in fact COMO Castello del Nero boasts the first ESPA in the area that will astonish the guests with the use of products rich in plant extracts, botanical essential oils and marine ingredients for a successful outcome guaranteed. Revitalise in the magnificent outdoor Vitality Pool, and enjoy the luxurious range of heat and cooling experiences which cleanse body and skin, relax and soothe aching muscles and prepare your body and mind for the treatment experience to follow. SPA special offer available, valid with a stay of at least four overnights... contact us now for more information! The restaurant "La Torre" has been awarded with 1 Michelin Star with the Executive Chef Giovanni Luca Di Pirro and it is the first and only Resort with a starred restaurant in the Chianti. It is located in the old stable, offers a wide variety of dishes derived from the Tuscan tradition, rigorously prepared with organic, wholesome, high quality products. 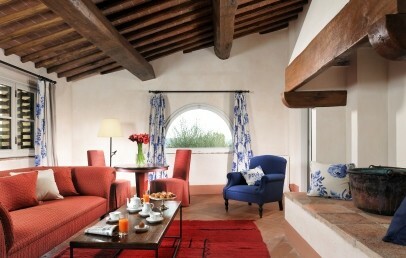 Pasta, bread and homemade pastries, highly selected local wines. In summer time you can have breakfast and dine on the enchanting "Garden Terrace", which offers a relaxing view of the olive groves and vineyards. The restaurant "La Taverna" offers for lunch and dinner Tuscan specialties, based on the local gastronomic tradition and the authenticity of the ingredients. During the warmer months the restaurant service is shift by the pool area. The bar, located in the ancient kitchen of the castle, with its inner rooms is the perfect place to take a break to sip a drink or taste the best local Tuscan wines. Also the bar service is shifted on the Ferrari Terrace during the summer months. The refined Tuscan winery locale is available for your enjoyment, from lavish receptions to informal olive oil and wine tasting in Chianti. For art lovers, the hotel offers a complimentary shuttle service to the centre of Florence or Siena at scheduled days and times. Those who wish to engage in sports, may use the fitness centre, participate in Yoga classes twice a week in pre-set days and hours or get information on nearby golf courses, on excursions, trekking. Pets are allowed, small size only until 10 kg, no supplement is required. 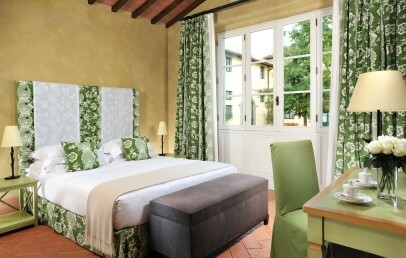 Large double room located in the main building or in the Hotel annexes. 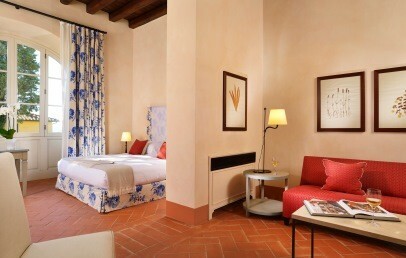 It features down duvets, cashmere bed blanket, warmly coloured walls, terracotta floors, wooden beam ceiling and refined furniture. The en-suite bathroom provides a shower, some also a tub, marble vanity top (some a double washbasin) and complimentary toiletries. On request it can be added a single bed for an adult or a child. 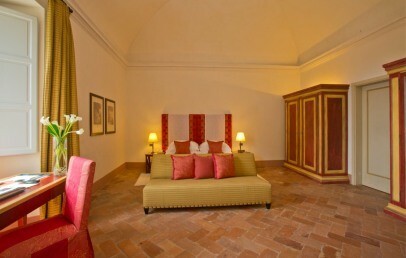 Outstanding historical Suites with original frescoed walls and ceiling located on the first floor of the main building. It has a bedroom with living area and original fireplace. 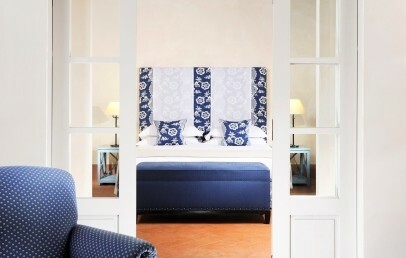 It features down duvets, cashmere bed blanket, terracotta floors and refined furniture. The en-suite bathroom has a separate shower and tub, marble double vanity top and complimentary toiletries. On request the Suite can host additional baby cot or single beds. 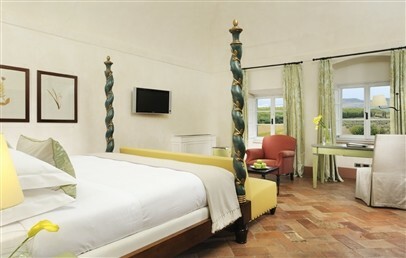 Special Suite amenities, complimentary soft drinks in mini bar, daily access to Spa Heat Experiences. The Duplex Suite are large and distributed on two floors with a living area downstairs and the sleeping area upstairs. 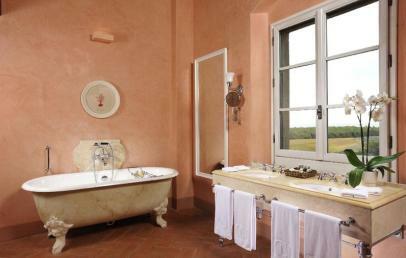 The furnishing is authentic in Tuscan style and the bathroom offers a shower and a separate tub. The view goes on the gardens and on the lakes, that are in the surroundings. Comfortable double room with located in the main building or in the annexe building. 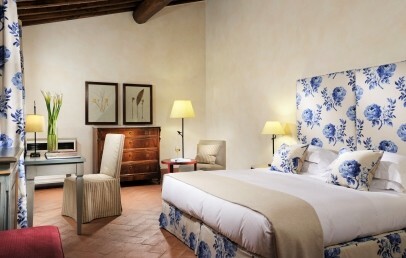 It features down duvets, cashmere bed blanket, warmly coloured walls, terracotta floors, wooden beam ceiling and refined furniture. The bathroom has tub/shower or only shower or shower and tub, marble vanity top (some rooms have a double washbasin) and complimentary toiletries. The view goes over the garden or courtyard. 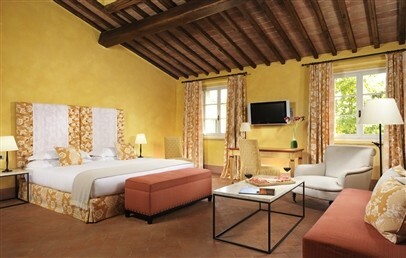 The Suite is characterized by Tuscan style and has a bedroom and separated living room. It features down duvets, cashmere bed blanket, terracotta floors, wooden beam ceiling and refined furniture (some have a fireplace). Some of the bathrooms have separate shower and tub, marble vanity top (some rooms have a double washbasin) and complimentary toiletries. The view goes out on the court yard or garden, some have view over the Chianti hills. On request it can be added a single bed for an adult or a child.